Should Curt Schilling Get Into The Hall Of Fame? This has been discussed since he retired this week and he may have good case. I will borrow some of what I put in my entry a few weeks ago about Bunning called Does Jim Bunning Belong In The Hall Of Fame? Click on this next ink to see where Schilling ranks in strikeout-to-walk ratio (relative to the league average) for all pitchers with 3,000+ IP. He is 2nd to Mathewson. I found the best fielding independent ERAs since 1920 (an imputed ERA based on walks, strikeouts and HRs with HRs being adjusted for park effects). Schilling ranked 7th among pitchers with 1500+ IP. The list went up through 2005. He is now over 3000 and my guess is that he has not slid too much since then (he was not on the 3000 list yet after 2005). I found that he was 44th in Park-Adjusted Pitching Wins Above Replacement Level. I think that was also through 2005. He has probably moved up several slots since then. Outs have a negative value, usually around -.25. For each player he calculates how many batting runs they had. This has a win value (usually around 10 runs per win). Something similar is done with fielding. He figures out how man runs a player saved compared to the league average as a fielder and this is converted to wins. Both batting runs and fielding runs can be negative. If a player had 20 batting runs that would be 2 batting wins. If he also had -10 fielding runs, that would be about -1 fielding wins. So his TPR or BFW would be 1 for that season. A player can have a negative value for a season. So he would be below average. But that does not always mean he had no value. He might have still been better than the next best player available (the replacement) who might have been more negative. There is no clear consensus on exactly what the replacement level in TPR is. So I did two lists. One with a TPR or a BFW of -2 per 700 PAs as replacement level and one with -3. I divided each guy's career PAs by 700. Then I multiplied that times 2 or 3. That result got added to his career TPR to get career value over replacement. For example, in a season with 700 PAs and a TPR of 0, the player is still either 2 or 3 wins better than replacement level. A player with a TPR of 6, which puts you in the top 200 seasons all-time, would be 8 or 9 wins better than replacement. Suppose a player had 7,000 career PAs. So that is 10 full seasons. If he had a career TPR of 20, his wins above replacement would be 34 or 41. Click here to see the all time rankings through 2004 using -2 BFW as the replacement level. I used everyone that had 2,000 PAs through 2004 (with PAs including just ABs and walks). Click here to see the all time rankings through 2004 using -3 BFW as the replacement level. The players were compiled using the annual listings in BFW from Retrosheet. Most of the top ranked players will not be a big surprise. Bonds is first followed by Ruth. Two guys in the top 40 using either a -2 or -3 TPR for replacement level that are not in the Hall of Fame are Ron Santo and Bobby Grich. Bill Dahlen, too. So the declines are .102 and .093. 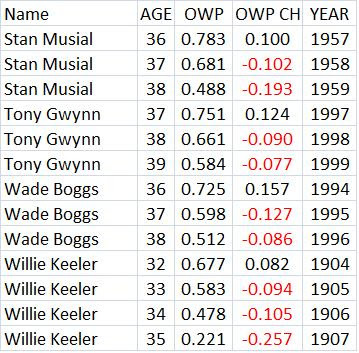 For players who had long careers, such big back to back drops in OWP are somewhat rare, especially for someone under 30. Some stories I read using google news search indicate he is in better shape this spring and is hitting better than usual this pre-season. So maybe he has taken the necessary steps to stop the decline. To see how unusual his declines are, I used a list of players that I have compiled before. This list includes all players who had 15+ seasons with 400+ plate appearances from age 20-40. Then I found all cases of players having back to back seasons of a drop in OWP of .075 or more. The tables below show all of these cases (more discussion of the tables below). There are 22 such cases. But in only 3 of them, did the fall in OWP start before the age of 30. Those belong to Robin Yount, Jake Beckley and Mickey Vernon. Beckley's started at age 23 and neither of my biographical encyclopedia's mention anything. Same for Vernon's decline. Yount had shoulder problems during the 1984 and 1985 seasons and actually had surgery twice. 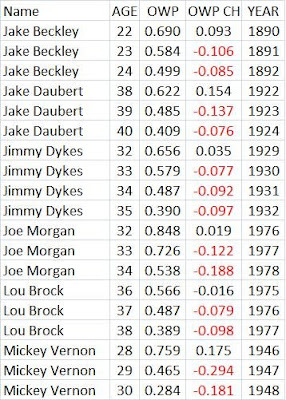 But both Beckley and Yount are in the Hall of Fame. So if Howard can end up with 15+ seasons with 400+ plate appearances he has a 2 out of 3 chance of making the Hall of Fame. If I had limited the study to declines of .093 or more, there were only 8 guys. The only one whose decline started before age 30 was Vernon. So who knew that he had something in common with Howard? In the tables below, the numbers in red are the decline years. The year before the decline is there for each player for reference. Two guys had 3 straight years that fit the criteria. They were Jimmy Dykes and Willie Keeler. Yount and Honus Wagner had two such streaks. The average age at which the decline started was 33.95. 17 of the 22 cases started at age 33 or older. 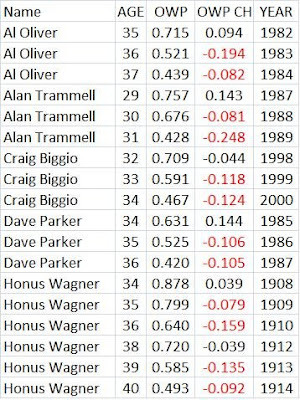 There were 91 players with 15+ seasons with 400+ plate appearances and 22 back to back seasons of a drop in OWP of .075 or more. So nearly 25% of the 91 players had these big back to back declines. That makes it look like what has happened to Howard is not that rare. But what is rare is the age at which it has happened to him. What happened to these guys in the third year? Did they finally rebound? Well, we know that Keeler and Dykes each had declines that fit the criteria in the third year. 5 players did not get 400+ PAs the next year. The average change in the third year, including Keeler and Dykes (who were the only declines), was a positive .078. 8 of the 17 had changes of +.100 or more. So Howard has a good chance to bounce back but also has a chance not to make it to 400 PAs. Mickey Vernon improved .295 in the third year. Does Jim Bunning Belong In The Hall Of Fame? This issue came up recently on the SABR list. One of the issues was why were pitchers from his era who seem to have been about as good he was not in. Then someone else mentioned that maybe the Veterans committee put him because he is a Senator. I posted some evidence on this. Basically it was references to research I had done in the past and seeing where Bunning ranked. I will put that post below, but first something new, although it is a simple, rough estimate of his value (I used Fielding Independent Pitching ERA or FIP ERA to find an imputed winning percentage for Bunning which is fairly high-it's all based on how good he was at strikeouts, walks and HRs). I find that there is some evidence for him being in the Hall, but I don't think it is all on his side. He had a great strikeout-to-walk ratio, which is one indicator of how good a pitcher is. 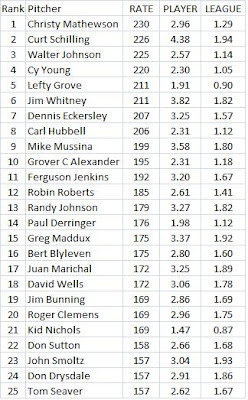 Below are the top 25 pitchers with 3000+ IP in strikeout-to-walk ratio relative to the league average. Bunning is 19th, which is very good. Mathewson is 1st. He had a strikeout-to-walk ratio of 2.96 while the league average was 1.29. Since 2.96/1.29 = 2.30, Mathewson gets a 230. Data came from the Lee Sinins Complete Baseball Encyclopedia. I calculated his Fielding Independent Pitching ERA or FIP ERA. The idea is that a pitcher controls HRs, BBs and Ks and hits on balls in play not so much (if you have not heard of this, google Voros McCracken). Here are the key calculations. HRs, BBs and Ks are per 9 IP. I used Bunning's stats and adjusted them to the AL stats of 2008. Bunning's Ks per 9 IP was 6.83 or about 25% above average. In the 2008 AL K/9IP = 6.36. Raising that 25%leaves 7.97. He walked 2.39 batters per 9 IP or about 26% fewer than average. In the 2008 AL BB/9IP = 3.32. Lowering that 26% leaves 2.47. So those numbers will get plugged into equation (1). The league ERA in the AL in 2008 was 4.35 and the constant for equation (1) works out to 3.21. We still need to calculate his HRs per 9 IP. He actually gave up 372 HRs while the average was 346. So it looks like Bunning did poorly here. But he pitched in Tiger Stadium for part of his career where an above average number of HRs were hit. So I adjusted his HRs allowed in each season based on the HR park factors from the STATS, INC. All-Time Baseball Sourcebook. For example, if Tiger stadium gave up 20% more HRs than average in a season, I reduced his HRs for that year by 10% (only half of the 20% since he only pitched half his games there). In some of his years with the Phillies, the park factor was below average. After doing this for each of his seasons, his HR total came out to 349, or almost exactly average. In the AL in 2008, there was just about 1 HR per 9 IP. So I used that for equation (1). With the HR, BB and K data done, I found a FIP ERA of 3.73 for Bunning (adjusted for the 2008 AL). So Bunning pitching for an average team would have a .577 winning pct. For pitchers with 3000+ IP, he would be tied for 42nd (with Jack Morris). But I did not calculate the FIP ERA or Pythagorean winning percentage for anyone else. I am just assuming if I did it for everyone, just as many guys would move ahead of Bunning as would fall behind. 42nd is pretty good and seems high enough for a starter to make the Hall. Now for the post to the SABR list. I found the best fielding independent ERAs since 1920 (an imputed ERA based on walks, strikeouts and HRs with HRs being adjusted for park effects). Bunning ranked 13th among pitchers with 3000+ IP. I found that he was 51st in Park-Adjusted Pitching Wins Above Replacement Level. It also looks like he out pitched Koufax in neutral parks while they were both in the NL. But he only had 257 Win Shares through 2001, tied for 291st. Not sure where that ranked among pitchers. 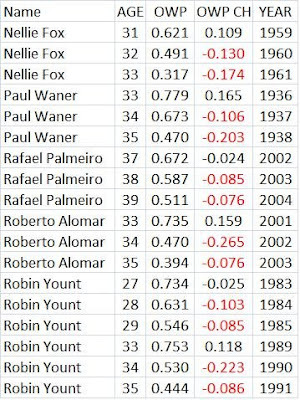 He ranks 67th in adjusted pitching wins in Pete Palmer's baseball encyclopedia.